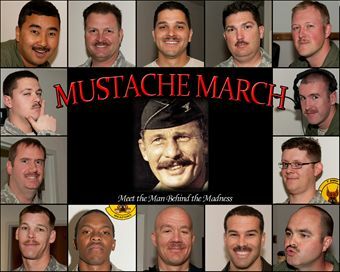 It’s that time of the year again when airmen of every age and rank trade in the their regulation clean shave and allow their facial hair to bloom like the first flower buds of spring in honor of triple ace Brig. Gen. Robin Olds. Olds was famous for his skills as a decorated fighter pilot and for the signature handlebar mustache he grew while serving in Vietnam. But if you’re really serious about your stache and feeling competitive check out the Mustache March website here and follow this manifesto to ensure that your facial follicles are bragging-rights worthy.